One of the wonderful things about a personal learning network (PLN) is that it is personal. It is YOUR network, which YOU have designed, in order to meet YOUR needs. A PLN is something that is useful across the board. Regardless of your discipline, whether you are an expert or a beginner, having a network of people and sources that provide support, insight and up to date information is essential in a rapidly changing environment. This means that it is impossible to pin down exactly what a PLN is, and there is no ‘right’ or ‘wrong’ way to develop or maintain a one. PLNs range from a low level support net to an extensive and essential part of everyday practice. Participation may range from an occasional skim through online posts to regular interactions throughout the day. The PLN may play an intensely important role for several weeks, and then lie untouched for a month. This is one of the reasons why I describe the PLN as a personal learning network, even though it may also be a professional learning network. Being personal, however does not mean that we cannot learn from others’ experiences of this type of learning, and gain insight into different or more effective ways that a PLN may be used to enhance learning. This is the first of a series of posts which will give tips to make sure that you are getting the best from your PLN. It is easy to get into a habit of interacting at a surface level, browsing your everchanging dashboard without actually taking advantage of simple strategies that can transform your PLN. Being aware of how you are using your PLN may help to refine what you want to get out of it, and assist in creating a PLN that more effectively meets your learning needs. Hashtags are used across multiple social media platforms, including Twitter, Facebook, Tumblr and Instagram. Hashtags are used as a search term, drawing together all posts to do with that particular concept. This makes it much easier to follow conferences online (follow the conference hashtag to see all posts made by participants and presenters, whether you follow them or not), to research current thinking around a topic (e.g. #oer for open educational resources) or to participate in an online chat without needing to know everyone who is involved (e.g. #edchat). There is plenty of information available on how you should use hashtags when you share on social media . However within your PLN, hashtags can become a powerful way to manage information and to collate ideas and resources. They can even provide a way to discover new and useful connections which expand your network. Use a tool like Tweetdeck to follow particular hashtags. Tweetdeck is a good one to begin with if you are new to social media dashboards, because it is owned by Twitter and just focuses on Twitter hashtags. Once you get the hang of looking across several columns of information, you may like to explore other tools like Hootsuite, which provide the same service, but across multiple social media platforms. These dashboards separate out the posts made by others according to what you want to focus on. You can search for a particular hashtag (like a conference hashtag or a tweet chat) and then in that column only those posts including that hashtag appear. It makes it easier if you find the constant stream of random and disconnected ideas disconcerting. You can use these tools to watch particular people also (if there is one person who tweets such good information that you don’t want to miss a single post). If the constantly updating feeds on Tweetdeck aren’t your thing, consider using a reader like Flipboard to access information attached to hashtags. Flipboard is accessible on computer or mobile device, and each version has its strengths and weaknesses. For following hashtags, I prefer to use the Flipboard App on my tablet device or phone, as it is far simpler to navigate and feels easier to personalise. On the app, it is a simple process of entering the hashtag you wish to learn more about into the search bar at the top of the screen. It will then provide a list of options – choose social to nominate your platform of choice, and watch as a beautiful magazine forms before your eyes, filled with the most recent posts which include this hashtag. Here’s a tutorial which helps beginners design a magazine around a hashtag. 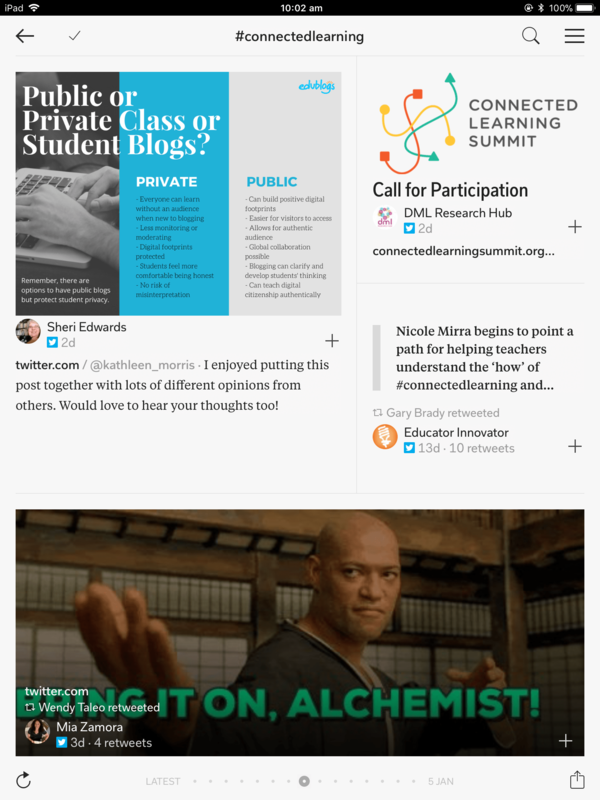 Below is a screen capture from my #connectedlearning magazine – you can see that the page is visually appealing, and by swiping left, I turn the page to reveal more posts. This is great for evenings when your eyes are tired and you don’t want the busy-ness of social media, but you would like to see the latest news. Sometimes your network can feel stale, and if you haven’t added any new connections for a while it might be time to seek out some fresh input. A wonderful way of discovering people who share your interests is to use hashtags to see who is posting what. Think of a keyword which describes your learning interests or something you’d like to find out about, pop a hashtag in front and start searching! This has recently becomeeven easier on Instagram, which has just introduced the capability to follow a particular hashtag so that posts with that hashtag pop up in your feed without you needing to follow that person. A quick search on Instagram using the hashtag #connectedlearning brought up a range of pictures taken at various connected learning events, which introduced me to a number of interesting new people I hadn’t interacted with before. Often users will include their blog address in their profile, or their Twitter handle, so you can have a look across different platforms to see if you might like to become connected. Using hashtags across different platforms puts you in touch with all different users. whom you might have never discovered if you had stuck to one space! Who will you discover posting with that hashtag on Instagram? Don’t forget that hashtags work across different platforms, which may produce content or inspiration different to what you might have expected. If you normally learn within the highly text-based world of Twitter, you might find that using the same hashtag searches in Tumblr or Pinterest provide you with different results. While Tumblr is known for its young user base and its focus on fandom, a growing number of people are sharing interesting photos, art, quotes and videos about topics that you may not expect. Searching for #connectedlearning on Tumblr led me to this beautiful image created by Amy Burvall a teacher, scholar and creator who shares amazing work. This imagery might be just the thing you are looking for to inspire that next blog post/learning opportunity/presentation – and you may never have found it in your usual haunts! Being creative with hashtags will lead you to discover new and exciting pathways of thought and learning. They are a clever way of supercharging your PLN to make sure you are discovering the best quality resources and information – and be sure to return the favour, by hashtagging your own work so that others may learn from you!